I have to be honest, I'm loving the warm weather. The last two weeks have been really exciting in more ways than I can explain. Before I left to teach at the Minnesota Quilters Show in St. Cloud, MN last week, my family and I took a short little trip to Devil's Lake at dusk to photograph my new favorite machine stitched quilt ever! It was inspired by the Tri-Tri Again pattern and made into a no-waste quilt by using the pieces cut to create other blocks. I have shared photos of the quilt in sections but I wanted to share with you how stunning the lake made the quilt (just kidding, I made the quilt stunning). Our natural surroundings blessed the quilt with its glow and bestowed a sense of calmness both on the quilt and in me, allowing me to feel at ease for having completed such a big project when so many other deadlines loomed, as well as doctor appointments for which I could not prepare. As I have shared before, the quilt is very large and contains fabric from many different sources, some given to me and some purchased. We had to stand on a table so that the quilt would not drag on the grass! My sweet child took the photographs and waited patiently while the soft breeze moved the quilt, to take the photos. 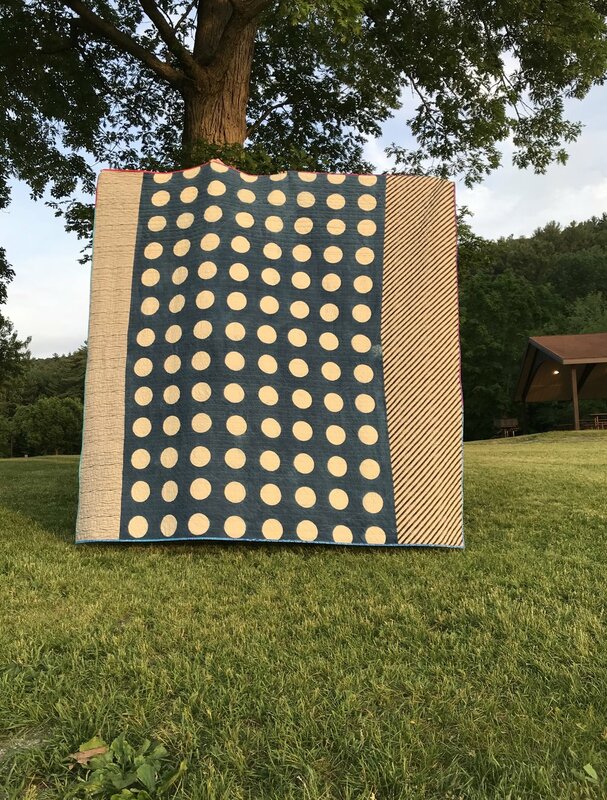 The backing of the quilt comprises of an indigo dyed coverlet completed in India and purchased by me in Maiden Rock, WI last year at Cultural Cloth. I pieced the sides using what feels like a blend of cotton and linen and quilted it using a wavy line stitch on my Janome 9400 QCP. The quilt measures 96" squared. The binding fabric includes different colors of batiks. I just love it. It brings me great happiness and a great sense of accomplishment.